How do you find out about professional organizations that could be a good fit for you and your goals? How do you decide which organizations to join, whether for networking in your niche, business development/new clients, or just better opportunities? Ladies, what are your best tips for finding worthwhile professional organizations? Psst: We’ve also looked at volunteering and joining a nonprofit board. Find out which groups others have joined. Talk to coworkers, including your superiors. Ask people connected with your college or grad school, like former professors and fellow alumni. Look at the LinkedIn profiles of your colleagues, and read trustees’ and board members’ bios. If you can, go to a meeting of a local professional organization and ask people about the other groups they enjoy. Be sure to attend a couple of events. This is key to get a feel for an association before you actually make a commitment. Social gatherings can be especially good for this purpose. You may find out it’s just not a good fit, or your experiences may confirm that you made the right choice. Find out what the membership fees are. Will your employer pay for them? If not, can you deduct them on your taxes? Make certain that you actually care about the organization. Choose one that feels worthy of your time and efforts. You’ll get more out of it, and fellow members will appreciate the enthusiasm of someone who really wants to be there. Once you join, go beyond the minimum. It’s the best way to meet people, develop your skills, and build your reputation. Join a committee, help plan an event, or offer to work on a special project. The American Association of University Women. One reader said she gets to network with professional women of all ages and find new clients. She also said that membership doesn’t have to mean a big time commitment. 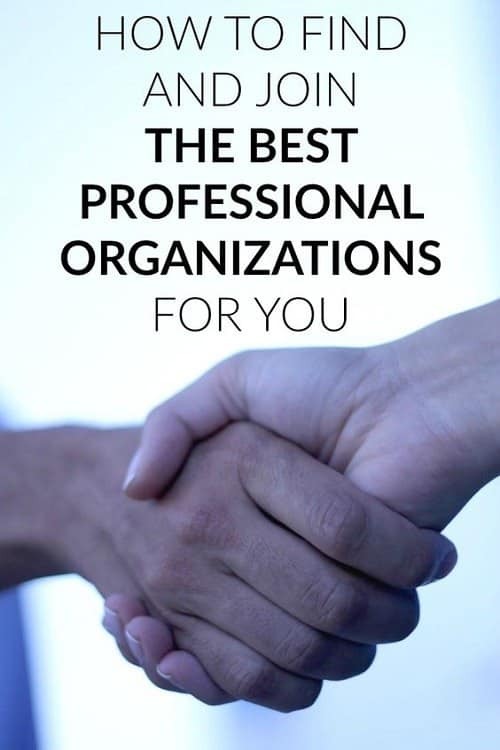 The professional society/organization for your field. Groups like these offer continuing education plus the chance to meet people at all career levels. Your local Junior Chamber of Commerce and Chamber of Commerce. They offer plenty of networking opportunities. The local young professionals group. Note that your success here might depend on the nature of your city’s group. One reader praised it as a good source of clients, while another found it full of people either trying to either sell something or hook up. DRI. A few readers recommended this organization for defense attorneys and in-house counsel. It provides CLE seminars, conferences, and networking opportunities. One commenter mentioned that her time commitment involved just one seminar and fly-in each year. American Inns of Court. This association is for lawyers, judges, and other professionals in the legal field. Many readers recommended joining an Inn, which doesn’t require a huge time commitment. One commenter called it one of the best things she’s done for her career, and particularly liked the opportunities to network with other lawyers, get to know judges, and connect with mentors. Of course, there are far too many professional organizations to list here. For a helpful list, check PINK, where you’ll find groups for various careers, geographic areas, demographic groups, and interests. Which professional organizations do you belong to? Which have you found to be the most helpful? Has anyone joined Young Professionals in Foreign Policy? I’m not in the field per se right now, but want to post graduate school. I’d love to get some insight if possible! K serious question. Does anyone believe joining a board, charity or organization actually helps their career? Or are you happy to do the work just to give something back? I truly believe the people who benefit the most from board, charities and organizations are the people who would do it even if you told them it would make no difference to their career. In my experience, this extra-curricular work is profile-raising. It improves your name recognition and introduces you to people you wouldn’t otherwise meet. And maybe that doesn’t generate a job or a referral immediately, but it’s another sources for relationship-building. And if having more (and better) relationships would help your career, then yes, it does help your career (assuming once you join you’re not unreliable or problematic to the group). It depends on what your career area is. If you don’t need to bring in business and aren’t looking to change jobs and you don’t enjoy it then I would say no. I was on the board of a professional association as a very young professional and found it to be extremely helpful as an opportunity to connect with older professionals in my field outside of my direct reporting heirarchy. I am also active with my alumni group and church group that I don’t find to be professionally helpful but are fun, and I volunteer pro bono because it makes me feel better about my life, which makes me better at my regular job I think. I work and volunteer as a Board member in the nonprofit sector, and it has helped me find new organizational supporters (read: donors and volunteers) as well as integrated me into the community. I am active in my law school alumni association (on the board), local bar association (chair of the committee in my area of practice), local women’s bar association (on board), local bar association dedicated to my type of law. Then, same exact thing at the state levels. I opted out of ABA. I am in a National bar association type thing for my type of law. I think they are all a tremendous resource to discuss cases and get CLEs that actually help me in real life practice. Bringing in clients is an important part of my practice as well, so I think the more people you know, the more clients you bring in, one way or another. I am also active in my church but I don’t really advertise that on LinkedIn or any bio page because it’s for me, not my resume. ACLU also reached out to me to be on their local board but I didn’t have time. I am wrapping up a couple of leadership positions though, and once I revert to regular membership again, I’d like to join Girls on the Run or coach a cross country team maybe. Threadjack for advice! I’ve been in my current position a year. My supervisor at my previous employer left, and they encouraged me to apply. I did, and I’m now one of the final 2 candidates. I’m seriously considering taking the job, but I feel bad leaving my current place after only a year. I wasn’t looking and don’t have any other applications in; my previous employer wants me back because I know the work. In fact, they brought me back as a very part time contractor during the transition because they needed someone to pick up work in progress. One pro is that this supervisory position would pay significantly more. I took a slight pay cut for my current job, and I have a lot of student loan debt. A higher salary would be a huge help for my family. The biggest con is feeling somehow disloyal leaving after a year. The search process to hire me was 5 months. I would feel bad leaving my current position in the lurch, so to speak. Thoughts?? Do no kid yourself, if your current employer could find a way to have your role filled by trained monkeys, child labor from a developing country, or a robot, you would be out to there in a heartbeat for their economic benefit!! Do not hesitate to move on for the economic benefit of you and your family!!!! My thought is that if it suited your current employer, they would cut you lose with no guilt, no loyalty, no second thoughts. You have nothing to feel guilty for. You were a great worker, the old employer realized it, and did what it took to win you back. Honestly, if your new employer is willing to match the new offer, that’s something to consider, but you certainly should not have to work for less than you are apparently worth out of some feeling of loyalty. Yay! I have to agree with the other OP’s! YOU must look out for YOU! That is what the work place is–dog eat dog. You do NOT have to settel for less then you are worth, so go for what you are worth. My DAD, who is Mensa Eligibel, told me early on NOT to think that peeople will pay you what you are worth, so you MUST jump from job to job. If I did NOT leave my job serveing supeenies in 2009, I would still be there, and my boss would STILL be grabbeing my tuchus every morning. Do I miss that? No. Even here, when Frank does cheep thing’s, I say to myself, If I find a better job, I will leave. I am thinkeing of goeing in house, or teacheing law school if I do NOT get married this year and have babie’s, b/c I am NOT getting any younger, and billeing 7500 hours a year is VERY tireing. FOOEY on 7500 hours! So go for the new job and do NOT look back. YAY!!!! Was the previous supervisor a problem at the old job? Seems a bit odd to leave a place and run back – why did you leave in the first place? No value in guilt – one year is ok as long as it isn’t a habit that shows on your resume. Yes, yes, yes to AAUW. Good for networking and an amazing, smart organization for women with innovative projects and original research. Also, mom groups for client building. There are also plenty of Moms in ___ professional groups (but they may be informal, or start one). I thought it would be ghettoizing, but it feels like a secret mafia. As an association executive, I cannot speak more highly about the benefits of joining an association, civic group, charity board, or similar. There are so many organizations out there that could be a good fit, provide excellent networking, and great satisfaction for ‘paying it forward.’ Also, you may decide down the road that working for said organization would be a good fit – I’ve seen this happen a lot. To learn more about the association and non-profit community, please check out http://www.asaecenter.org and http://www.thepowerofa.org. Through these sites you can find organizations that could be a good fit and learn more about the benefits of volunteering.